Complimentary Maternity Session - valued at $400! Add any extra at all and receive a COMPLIMENTARY personalised slideshow of your labour & birth story. Valued at $300! Add $900 for your very own exquisite 8 x 8" Album. Add $1600 for a personalised Slide Show, a Newborn Session (approx. 80 digital images) & an 8 x 8" ALBUM Collection. A saving of $700! *Includes a complimentary Maternity Session valued at $400! $400 of your Birth Session Fee is to be paid up front and the balance by 36 weeks unless arrangements are made for a payment plan. Travel Fees apply outside of Greater Geelong area. I would love to meet you and take you and your birth supporters out for coffee and discuss birth, photography and whatever you like! It's a great way to break the ice and feel comfortable with each other before meeting in labour. You have the opportunity to ask any questions you like and I can go through a few things about what to expect from me during your labour and birth. I will be on call 24 hours a day, 7 days a week for 2 weeks before and 2 weeks after your EDD. If you have reason to believe your baby will arrive early, I'm happy to switch this on call time around to allow for the 4 weeks before your due date. I cannot emphasise this enough, I am happy to be a part of your story anytime you are comfortable having me there. There is no time limit on how long I am there for the labour or birth. If you prefer to be alone for the majority of your labour at home, I encourage you to still call early and let me know things may be starting and then either message or call when you are ready to have me there. You may choose to include part or all of your labour at home, transfer to the hospital, labouring in hospital, birth, first cuddles, first feed, baby's weigh, measurements and midwife checks. I love to capture the whole story including baby meeting siblings if it's possible. Birth Photography isn't for everyone. Some will happily share their images to anyone and everyone. However others may want to keep everything private and for their eyes only. I will respect your wishes either way. We can discuss the process of where the images go from my camera to your final printed project at the pre-birth consultation if you would like to find out more. Should you choose to have a backup photographer, this can be arranged and payment will be passed on should their services be required. I will arrange for the back up to attend the pre birth consultation if you like. *If the on call period has commenced the deposit will be non refundable. I will send you a sneak peek to your phone along with a custom Digital Birth Announcement to use on social media and send to family and friends. Book your Birth Session with Bella Arte Photography and you will receive a COMPLIMENTARY Maternity Session valued at $400! This will include 12 digital images for you to download via an online gallery. All Edited Images will be provided on a beautiful engraved keepsake boxed USB. The number of digital images provided for birth changes depending on the length and circumstances of your labour. Expect around 80+ images, although it's not unusual for birth to be around 100+ images. It's very hard to say an exact number because you may have a quick labour or a long one. Extras - Prints, Albums, Frames etc. An A La Carte price list can be provided at any time should you decide you would like to print your images or arrange a beautiful album etc. WHAT HAPPENS IF THE PHOTOGRAPHER MISSES THE BIRTH? All clients will be offered a BACK UP Birth Photographer. If you decide to not have a BACK UP Birth Photographer and due to unforeseen circumstances I miss the birth, then you are more than welcome to transfer monies paid to a Newborn Session either in studio or in your own home. This means you will pay $400 at the time of booking your due date and the balance by 36 weeks as per the usual arrangements. 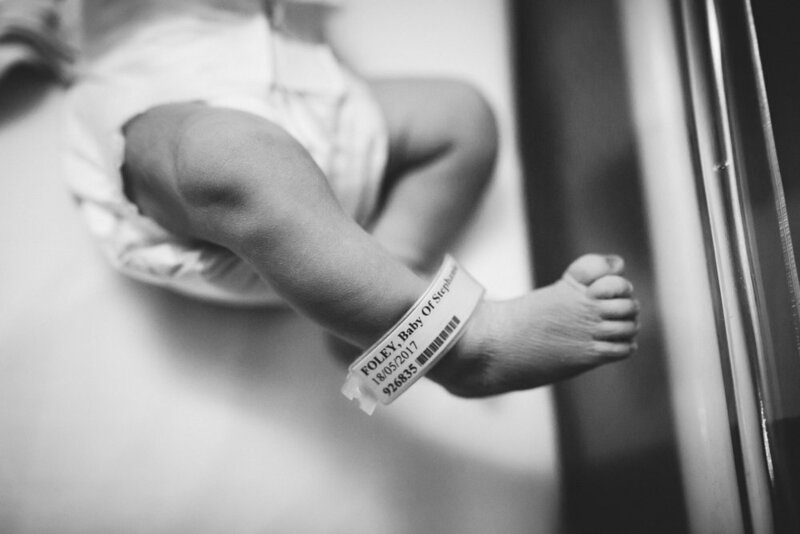 Rather than have a back up birth photographer, the arrangement will be for you to contact me as early as you can at the first signs so that I can prepare to head in as soon as possible. Every endeavour will be made to get to the birth. If you birth before I can get there, I will still shoot as much as I can on arrival, first weigh/measurements/first feed etc. Then a Newborn Session will be scheduled within 2 weeks after the birth and monies paid will be applied to this session and chosen collection. If this is something you are interested in, please give me a call on 0404 088 195 to discuss or feel free to send me an email. Why book with Bella Arte Photography? Birth to me is private, intimate and to be respected. My priority is always the birthing mother and her right to have a safe space to labour in. I am respectful of the professionals in hospital who have a job to do and will maintain the space for them and your birth supporters to fulfil their roles also. The camera shutter will be as quiet as possible and the lights will only be raised with subtlety, when it won't be disturbing to the labouring mother. I will take my cues from whatever and whoever is in the environment at the time even if this may mean stepping out for a few minutes to give the two of you time together to labour or holding your hand and reassuring your birth supporter that they are doing amazing too. Birth is a miracle unfolding and I will treat it as such. I have had 2 cesarean sections with my first two girls and then a homebirth with 2 midwives and a doula present for my 3rd. My birthing history and research has become a huge part of why I aim to give you the memories that will not only be the first hours and minutes of your newborn's life but to also show you the things you don't see when you are working hard to bring your babe into the world. The effect of seeing your own birth story unfold in front of you as you realise your own miracle is incomparable!